Healthy vision is one of our most treasured senses yet many of us take it for granted until it begins to fail. 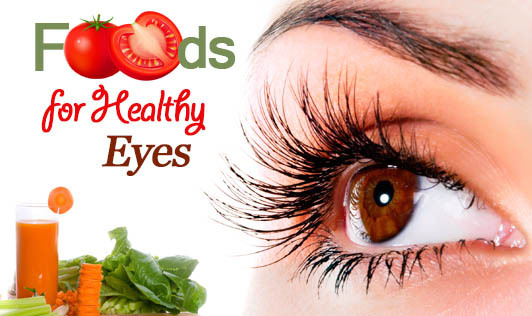 • To maintain healthy eyes, eat foods rich in essential carotenes, flavonoids, the amino acid glutathione other nutrients found in natural foods. These nutrients support flexible lenses and the health of the retinal area. • Fruits and vegetables also help subdue oxygen free radicals. The best fruit sources for protecting eyes from free radical damage are prunes, raisins and blueberries. For vegetables, it's raw spinach. Following are certain foods that will help maintain eye health and that may protect against cataracts, macular degeneration, and other eye problems. • Carrots-Carrots have long been recognized as an eye food due to their high levels of vitamin A. • Eggs-Eggs are an excellent source of eye nutrients like vitamin A, zinc, lutein, lecithin, B12, vitamin D, and cysteine. • Spinach-Another great source of vitamin A, spinach also contains other important eye nutrients including lutein and zeaxathin. • Tomatoes-Tomatoes are high in vitamin C and lycopene, two important eye nutrients. • Garlic-Garlic contains selenium and other eye nutrients such as vitamin C and quercetin. • Salmon-Salmon is rich in omega-3 fatty acids, which are important for maintaining overall eye health. It also contains folic acid, vitamin D, vitamin B6, vitamin B12, and vitamin A. Perhaps the most overlooked is the fact that much of the health of your eyes depends on the strength of the muscles of the eyes. And like all the muscles of your body, exercising your eyes can produce rapid and profound positive changes. Taking a vigorous walk for at least a half hour can temporarily reduce discomfort and pressure in the eyes.